What does Bullpup Dads ask from you? 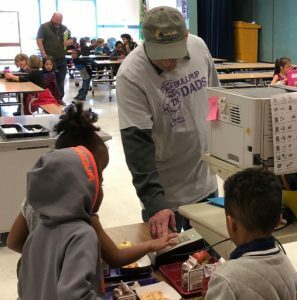 Small amount of volunteering – We hope each Bullpup Dad will volunteer at least one half-day at the school, and be a positive male role model to students. Interest in having fun with your student – Activities such as Pizza Night will help you build your connection to your student and to the great education he or she deserves. Watch Pup Press for announcements. Bullpup Dads is led by Thurgood Marshall staff, with help from many parent/guardian volunteers. Questions? Want to join? Contact volunteering@tmlink.org or the School Counselor.